When it comes to the knobs, buttons and dials on a sewing machine, few seem more intimidating and mysterious to beginners than the tension adjustment. However, stitch tension is an important part of sewing a strong, attractive seam, and adjusting tension is actually easier than you might imagine. In order to adjust the tension on your sewing machine, it's important to understand how tension factors into sewing a good, strong seam. This requires a basic knowledge of the workings of a sewing machine. You have probably noticed that your sewing machine uses two separate threads to create a seam. The bobbin holds thread, and the top portion of the machine also holds a spool. As you sew, the needle brings the top thread from the spool down beneath the fabric and catches it through the bottom thread from the bobbin. If you examine a seam, you'll notice that there's a stitch on the top of the fabric, a stitch on the bottom of the fabric, and a tiny knot in between the stitches. This type of sewing is called "lockstitch," and it was a major development in the invention of the first home sewing machines. Lockstitch makes a very durable seam. The tension adjustment on your sewing machine controls how tight or loose the top thread is when you're creating a lockstitch. If the thread is too loose or too tight, the small knots between stitches will be visible on the top or bottom of the seam. In addition to creating an unsightly seam, this maladjustment can actually affect the functioning of your machine and the durability of your work. Luckily, it's an easy problem to fix. You see knots on either side of the seam. The fabric is puckering along the seam. One of the threads keeps breaking as you sew. You see thread loops along one side of the seam. The seam appears loose or weak. Using some scrap fabric and thread in a contrasting color, sew a test seam. Use a fabric pencil to label the top and bottom pieces so you don't get confused. Examine the seam carefully. Are any of the knots visible? If so, you will need to adjust the tension. Determine whether the tension is too loose or too tight. If the knots are visible on the top piece of fabric, then the tension is set too tight. If the knots appear on the bottom piece of fabric, then the tension is too loose. Consult your sewing machine manual to find the tension adjustment on your sewing machine. On many machines, this is a large, round knob on the top right side. On some machines, it is a button or keypad. 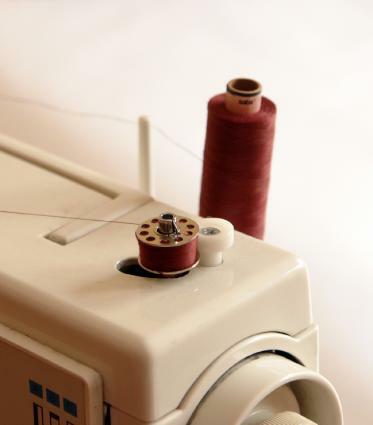 For many sewing machines, you can turn the dial in a clockwise direction to tighten the tension and turn it in a counter-clockwise direction to loosen the tension. If in doubt, confirm that your machine operates this way. Only adjust the tension a small bit at a time. Sew another test seam right next to the first one. Compare the two seams. If the tension needs additional adjustment, repeat Step 4 until it is correct. Like many aspects of sewing, machine tension is not an exact science. If you find that your tension is off, simply experiment with small adjustments until the knots are no longer visible between your stitches. With a little practice, adjusting the tension will become a quick process.